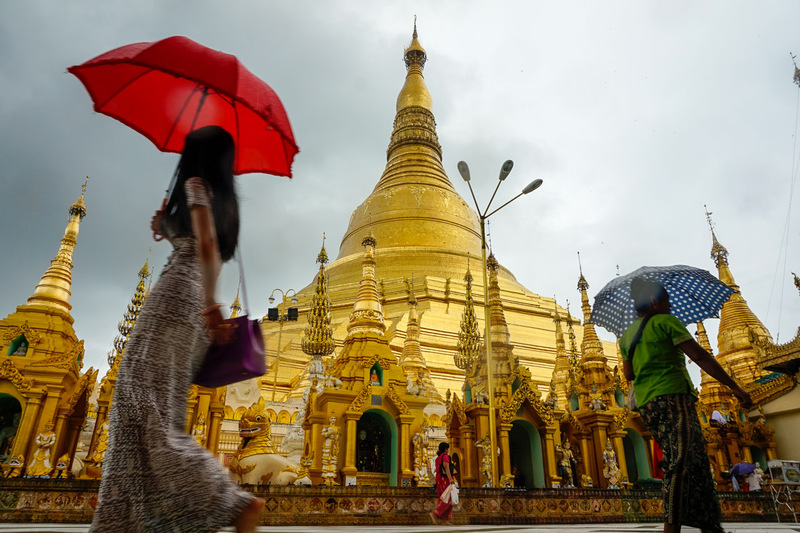 Myanmar, formerly Burma, has recently “opened its doors to tourists”, meaning that their previous boycott on tourism (due to political reasons) has now been lifted. 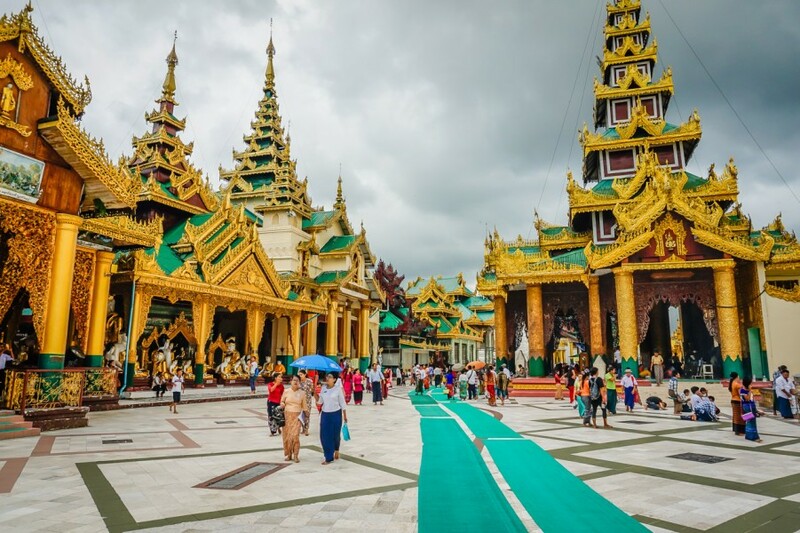 10 years ago it was still possible to visit Myanmar but obtaining a visa was much more difficult and there were little hotels/ tourist services available. 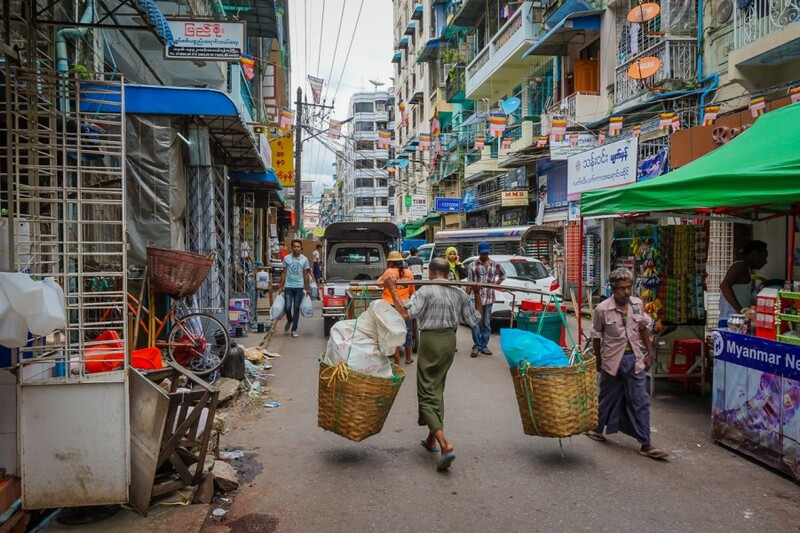 We certainly didn’t notice this lifting (in Yangon), as we hardly saw any other westerners during our travels here which made this city experience entirely different. There were no big red tour buses, no travel agencies, no franchises and no lines for anything. Quite frankly, it was refreshing and it made the city feel different to every other “big” city – it felt like it was just us exploring this new world. 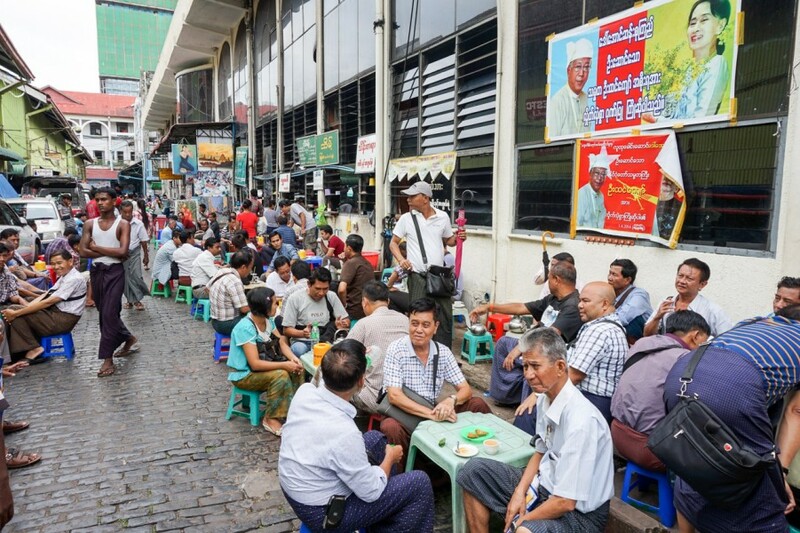 Myanmar has a population of 53.26 million people, with 5.1 million people in Yangon. 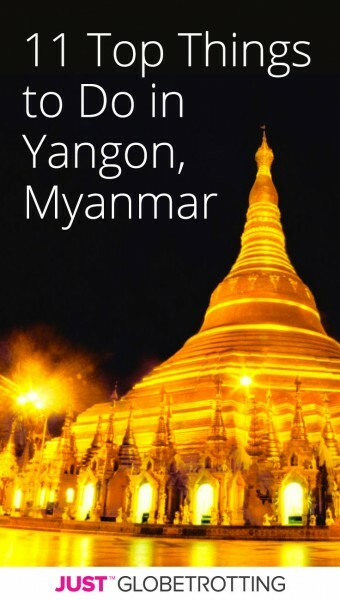 Up until 1989, Yangon was formally Rangoon and Myanmar formally known as Burma. This changed when the country fell under the rule of a widely maligned military junta that stayed in power until 2011 when it was formally dissolved. 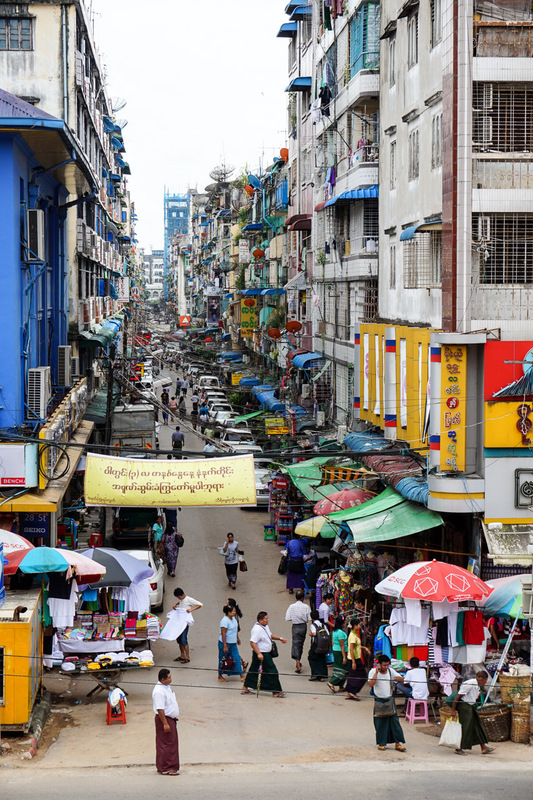 In 2009, 762, 547 tourists entered Yangon, in 2015 the numbers had reached over 4 million. That is one hell of an increase. 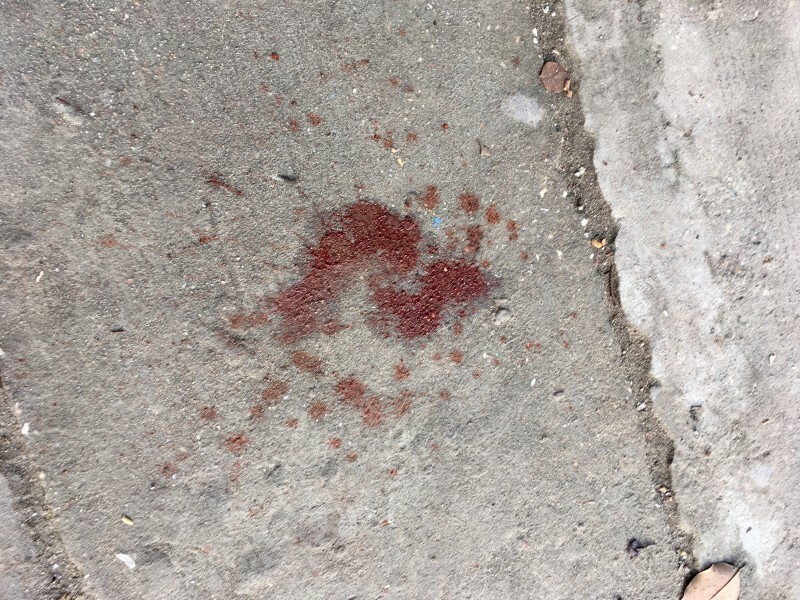 Avoid stepping on the red splatter marks all over the ground. 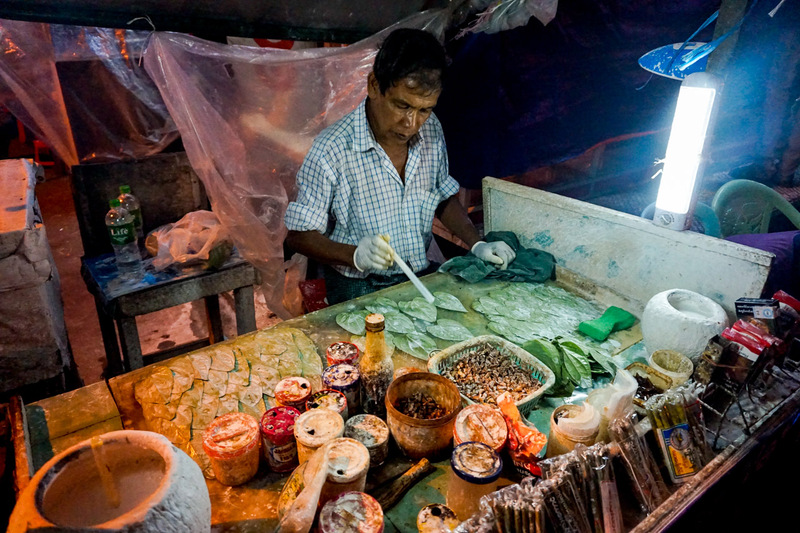 You’ll notice little stalls selling red tobacco and betel nuts, which are then rolled into leaves. Most men will chew this mixture and spit the red residue out on the street afterwards. It leaves their teeth a stained red colour and the ground, like a murder scene. It’s seriously gross. The majority of men wear a longyi, which is essentially a long cloth then tied at the top in a knot. It comes from the Buddhist religion but it is also worn for comfort due to the heat in Myanmar. Ventilation people, ventilation. 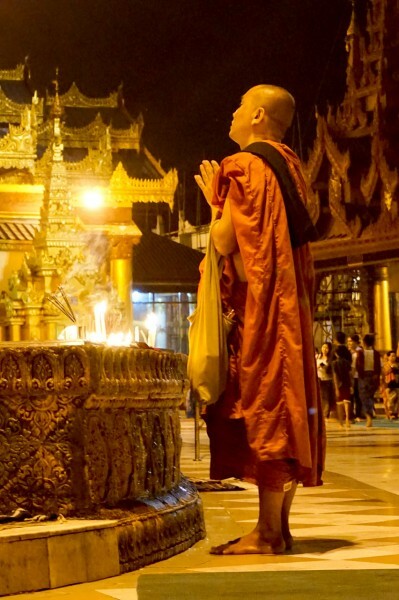 Myanmar is a Buddhist country, and 98% of the population consists of practising Buddhists. The monks we encountered were extremely friendly and were always very interested in having a chat with us. Thanaka is a cosmetic paste made from ground bark, wood or the roots of the Murraya tree and women and men wear it on their faces for moisturiser, protection from the sun/ mosquitoes and to help with acne. I got in on the action after our massage at the foot spa. Tea is everything in Myanmar, not only do they drink it, they eat it too (tea leaf salads). 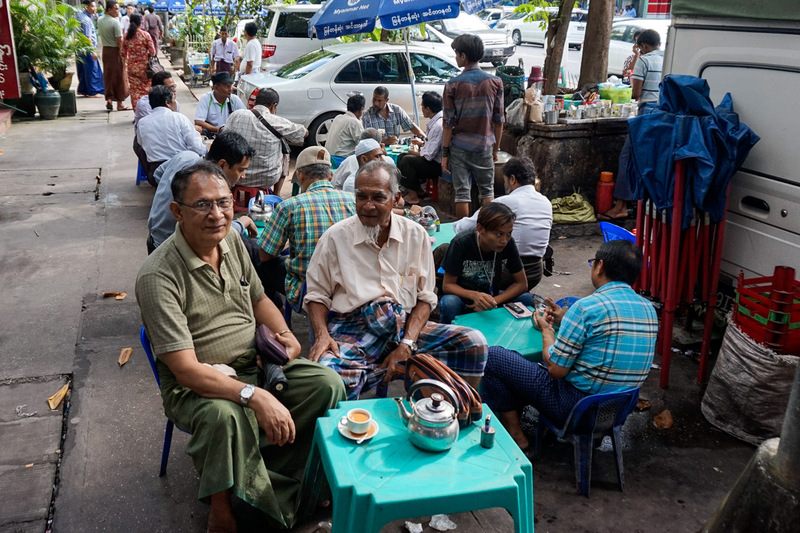 Tea houses in Yangon are simply an institution. 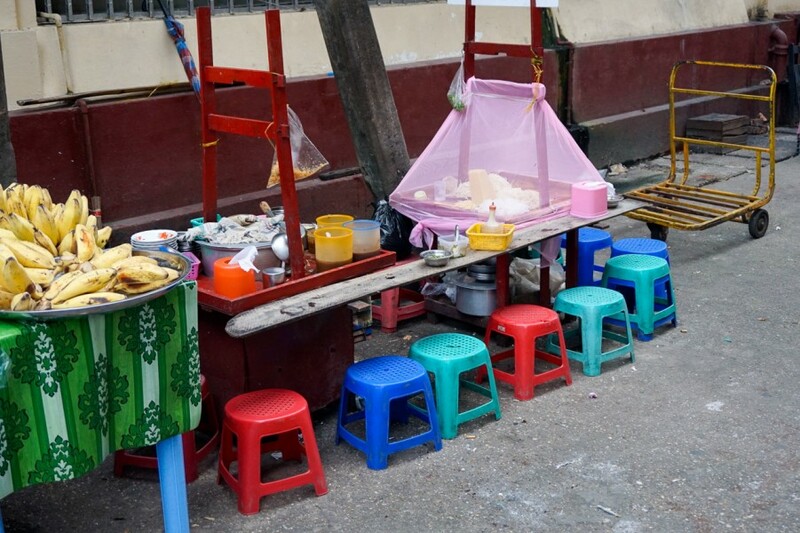 On almost every corner, small adorable child-sized plastic tables and chairs fill the sidewalks for people to sit and enjoy a cup of tea, a meal or simply a catch-up. Each time we walked past, people greeted us with smiles from ear to ear. Myanmar cuisine is a mixture of Thai, Chinese and Indian. After all, Myanmar is squeezed between all of them. 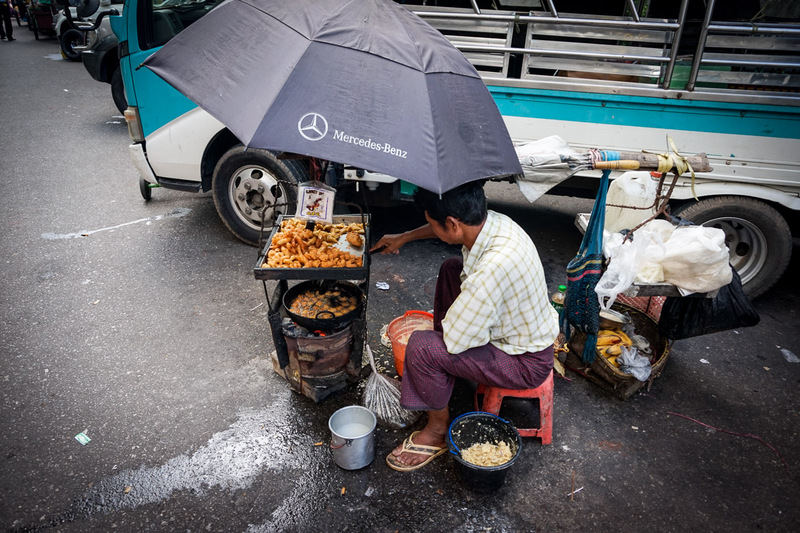 Whilst you’ll still get an array of curries, Myanmar has a lot of noodle dishes they’re proud of. 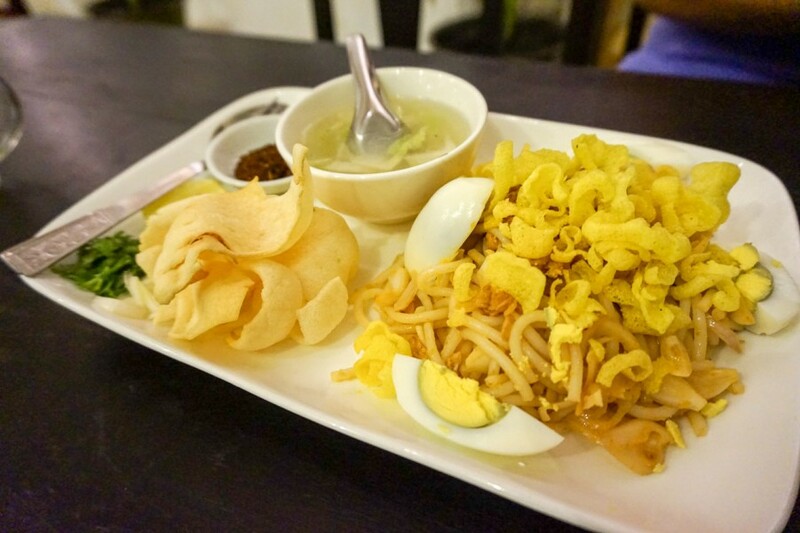 Our favourite was the Shan Noodles & least favourite, the Nan gyi thohk (shown below). It was like a cold spaghetti dish. Eating the local food is extremely cheap in Yangon, we had full noodle dishes for less than $2, curries for $3 and street food for less than $0.50c. 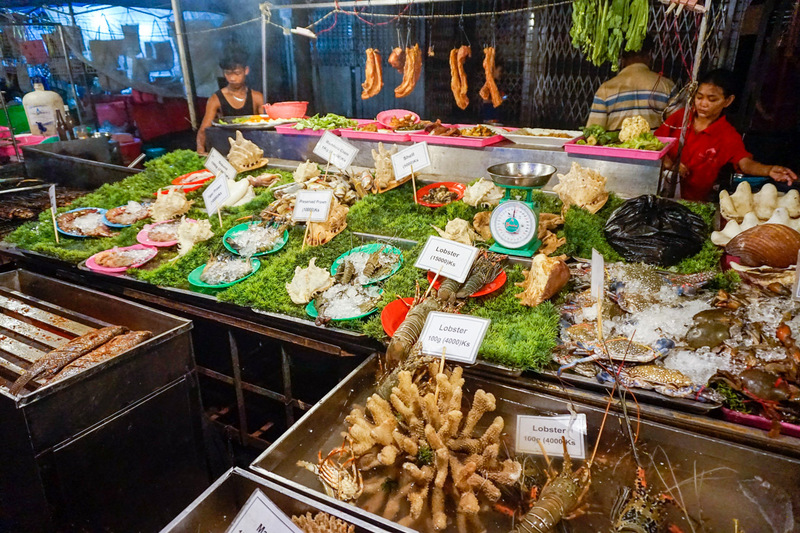 If you’re feeling adventurous, you could try deep-fried insects, some freshly squeezed sugarcane juice, coconut noodles, red bean and coconut pancakes, fried quail & chickpea omelette, or even a pig head salad. We didn’t get to try all of the local dishes (a shame we couldn’t try that pig head salad…) in Yangon but hopefully by the end of our time in this country we would have worked our way through some others. 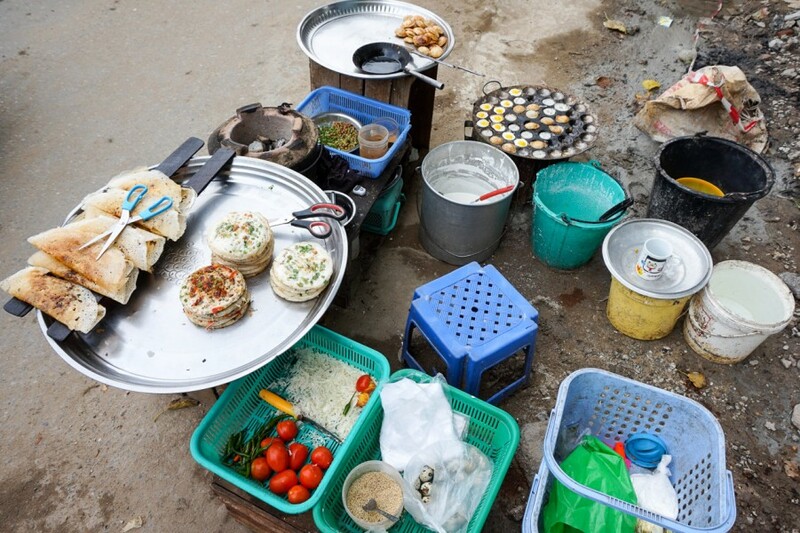 Click here for a full list of dishes to try in Myanmar. 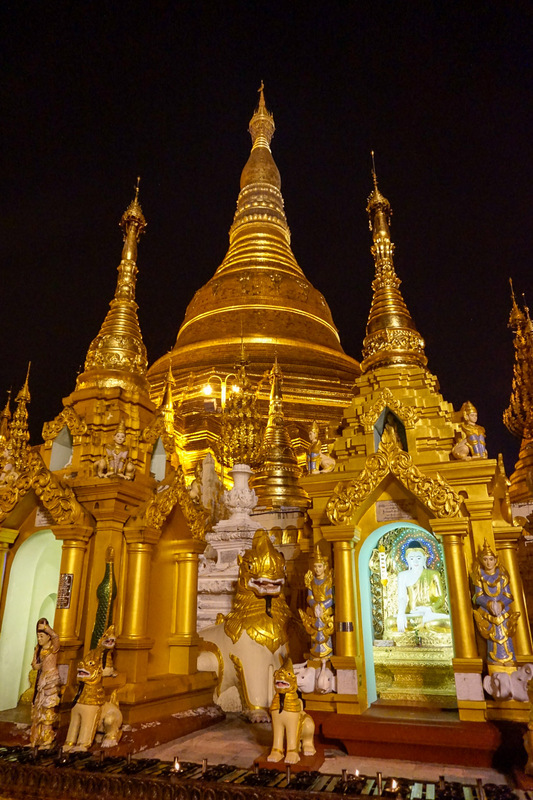 The Shwedagon Pagoda was extremely impressive. It can be seen from almost all angles of the city and is quite possibly one of the most underrated buildings in the world. For one, it didn’t feel like a tourist attraction. In fact, we were the only westerners there the whole time. This, of course, brought a lot of attention and people continually asked us for our photos but we didn’t mind, nor did they mind we were there, in their religious space. We walked around the main stupa admiring the exquisite golden detail that glistened in the sun. It is completely solid with every inch covered in gold, including a 76 carat diamond on top. 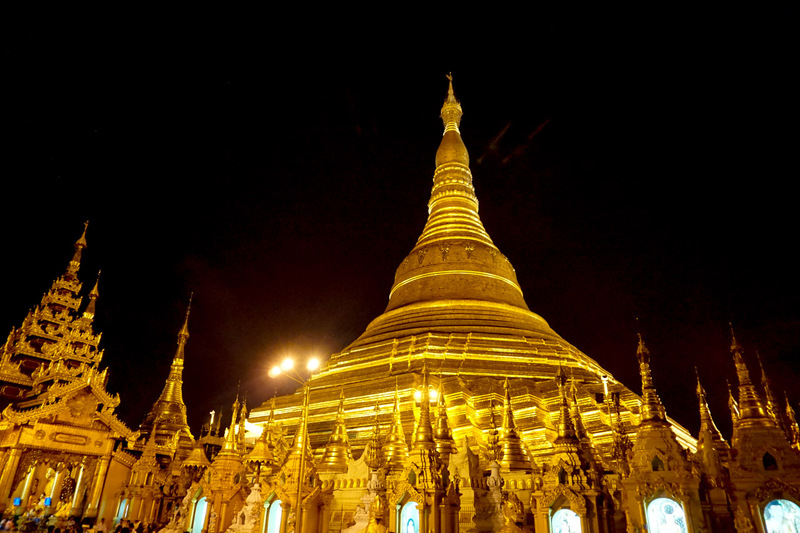 In total, the stupa holds over 2000 carats. Holy smokes! 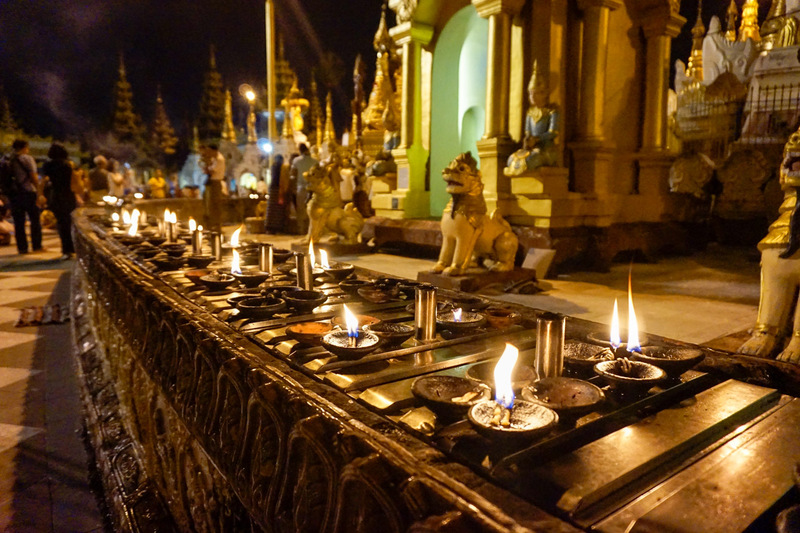 The small temples surrounding the main stupa were also incredible and extremely detailed with flowers, buddhas, candles and of course, gold. 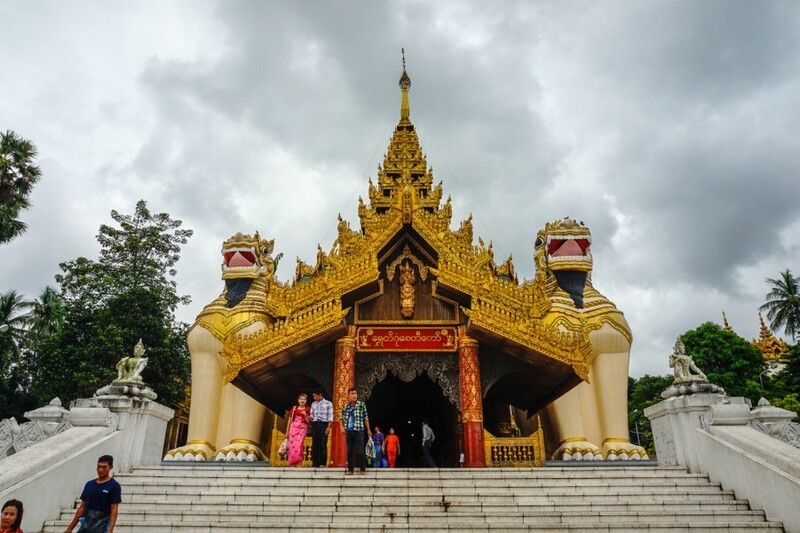 The locals of Yangon literally live out their everyday lives worshipping this pagoda and it was so interesting to be part of. 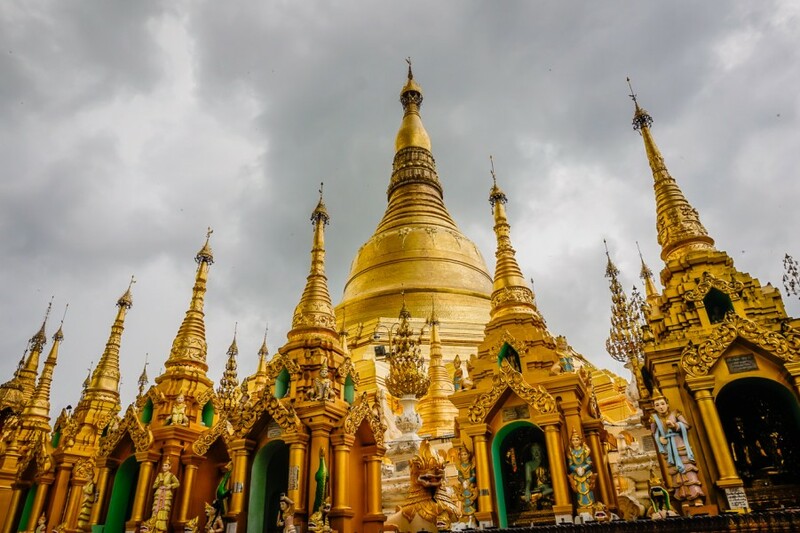 The best time to see the Shwedagon Pagoda is just before sunset, this way you can see it with 2 different aspects of light. It costs 8000 MMK ($6.50 USD) for entry. Ladies, make sure you have your shoulders and legs covered and men, no shorts above the knees. If you don’t have the appropriate clothing, you can rent it free at the entrance. Bring some small change to donate to the ladies minding your shoes. 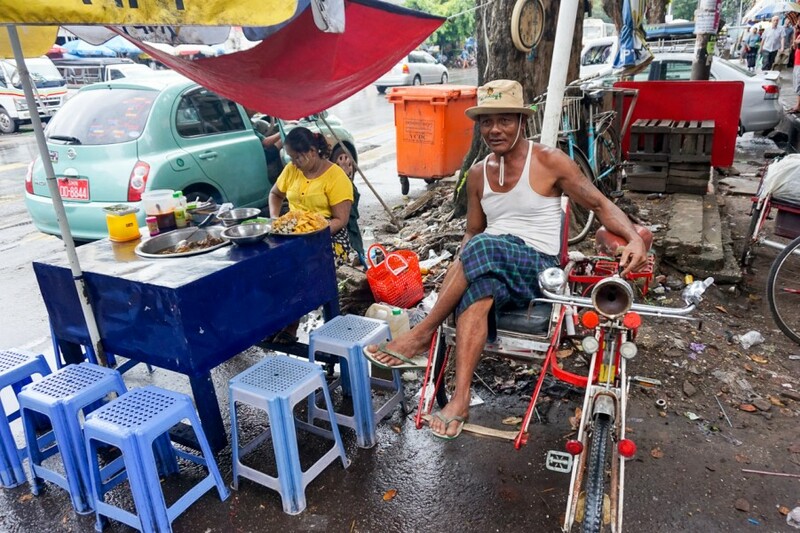 “Burmese Foot Massage”. Where do we sign up? Sapel Foot Spa has a menu of choices but we went with the 75-minute head to toe massage, primarily focusing on your pressure points. We were sat up for the entirety of the massage whilst our feet soaked in a wooden bucket filled with salts & hot water (although poor Jacob’s didn’t quite fit in the bucket!). Every 20 minutes they brought you a new cup of tea and they were extremely gentle & friendly. I must say, the weirdest part was the head massage where they proceeded to smack your head for 30 or so seconds. This was slightly confusing…The whole 75min treatment cost a mere $15 USD. 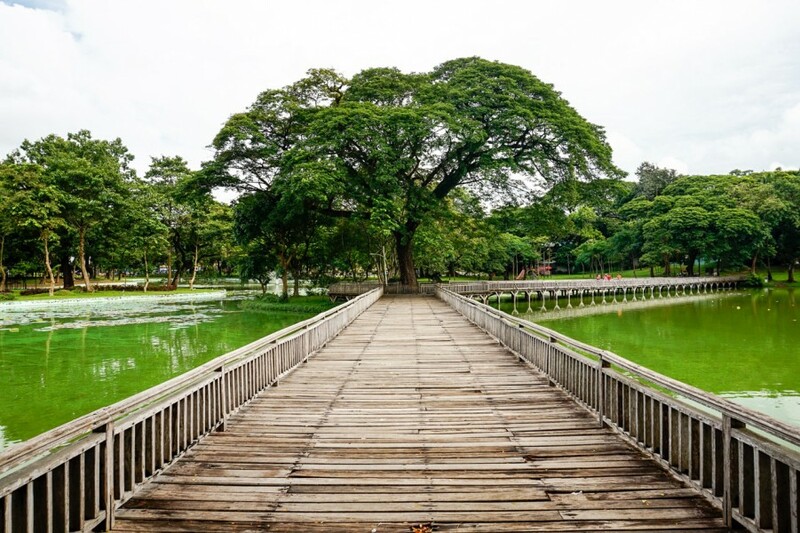 Every city needs an escape and the Kandawagu Nature Park was a great place to do just that. 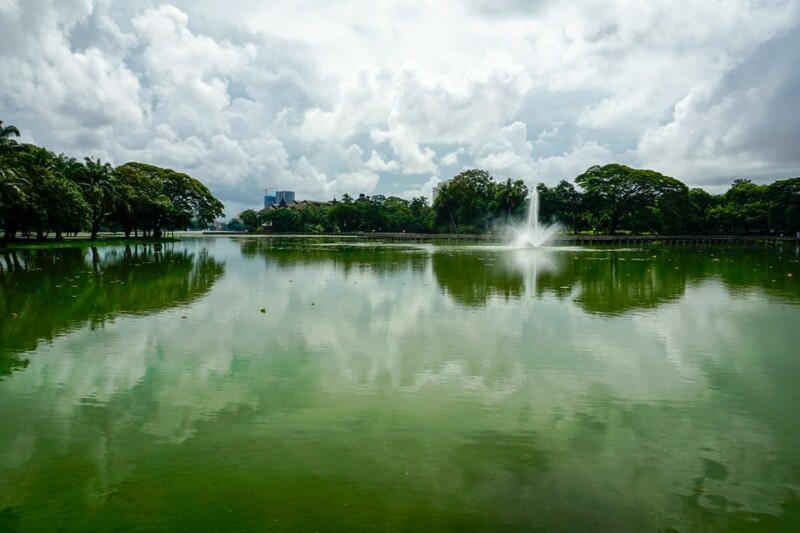 Take a walk through this park, enjoy the open green spaces, the long boardwalks, water fountains and a break from the city life. 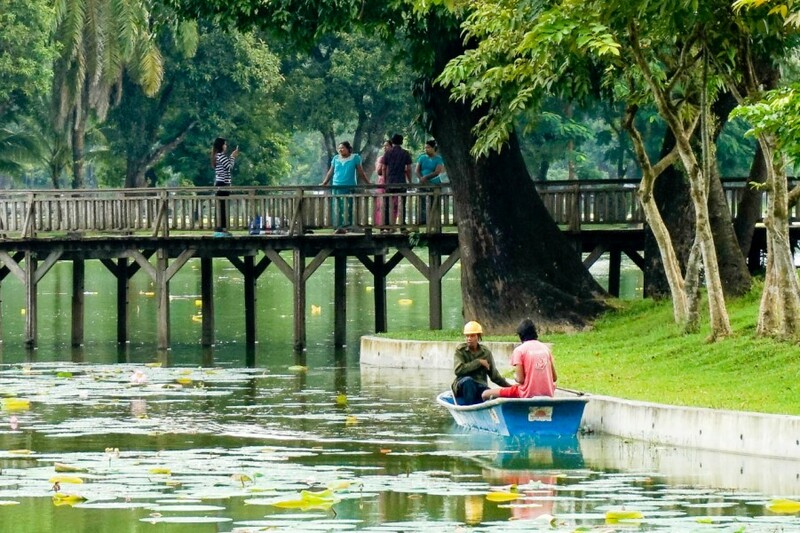 The park is 3km from downtown Yangon and a very cheap $2 taxi ride. Keen for some exercise? 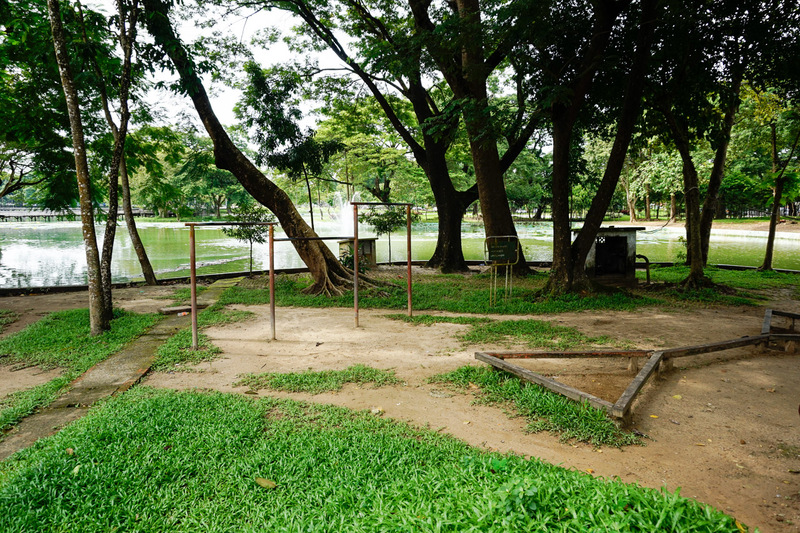 We came across a running path and 2 outdoor gyms and they were more than sufficient. Many locals asked to have photos with us in this park, then walked away giggling. I know, I know, I’m a giant. 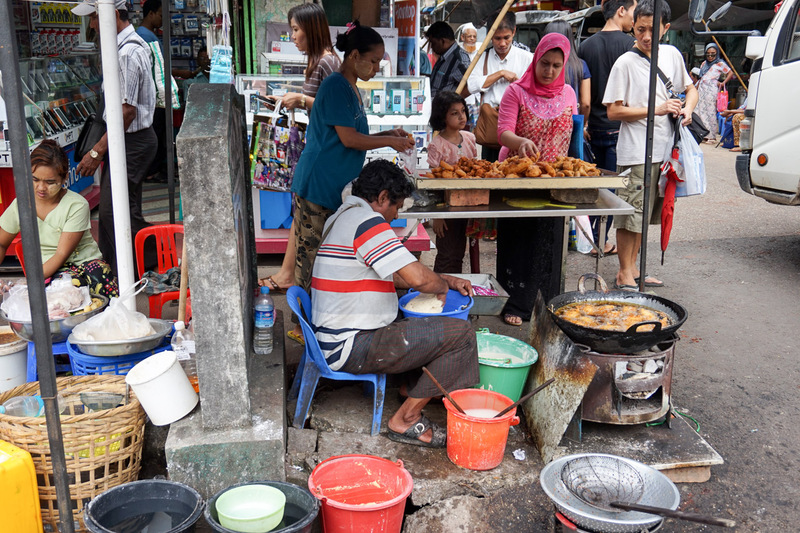 The food quantities in Yangon are like nothing we’ve seen before. 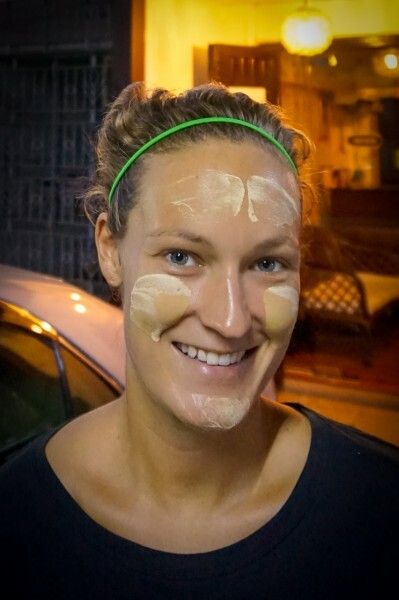 It is a HUGE part of their culture and is absolutely everywhere, on every corner. 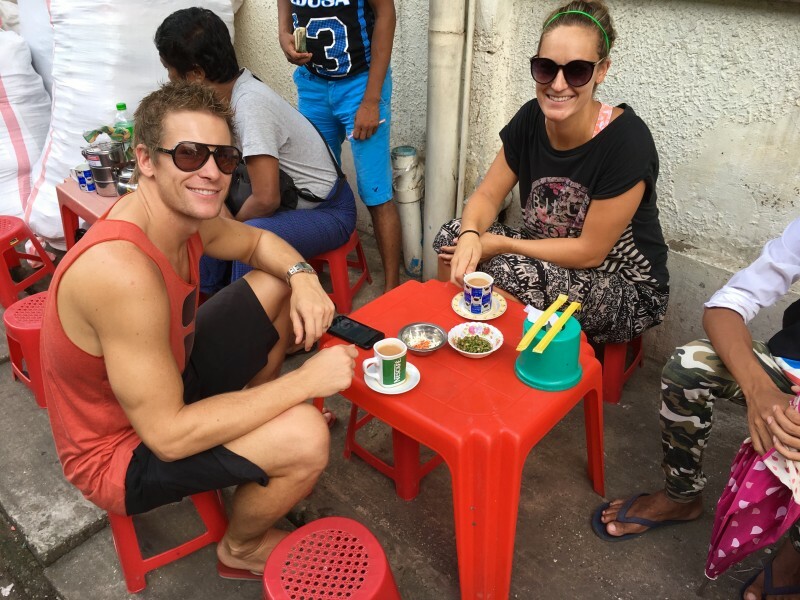 It was unbelievable the amount of food we saw on a day to day basis, outside of restaurants and smack bang on the streets. Street food goes for as cheap as $.50c, however, our stomachs were quite wary, so we avoided the meats and stuck to veggies. 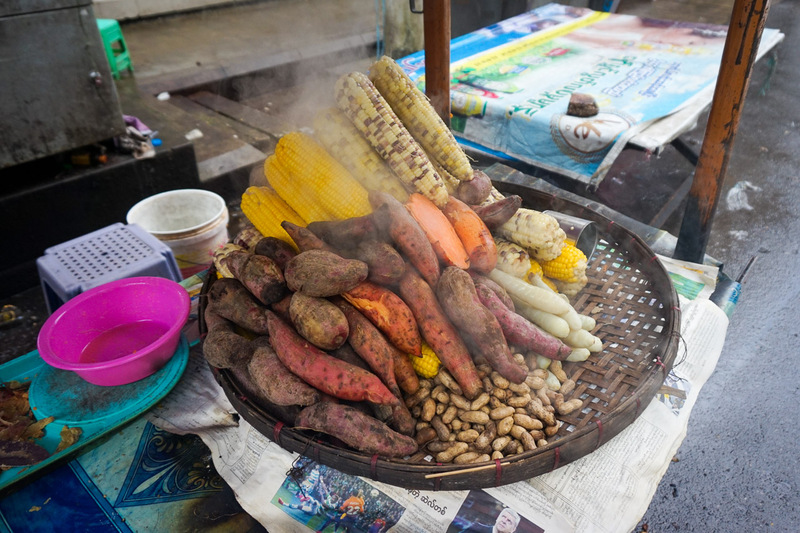 We tried roadside sweet potatoes (20 cents), fresh fruit juices ($1), deep-fried samosas and quail eggs that Jacob tricked me into eating! 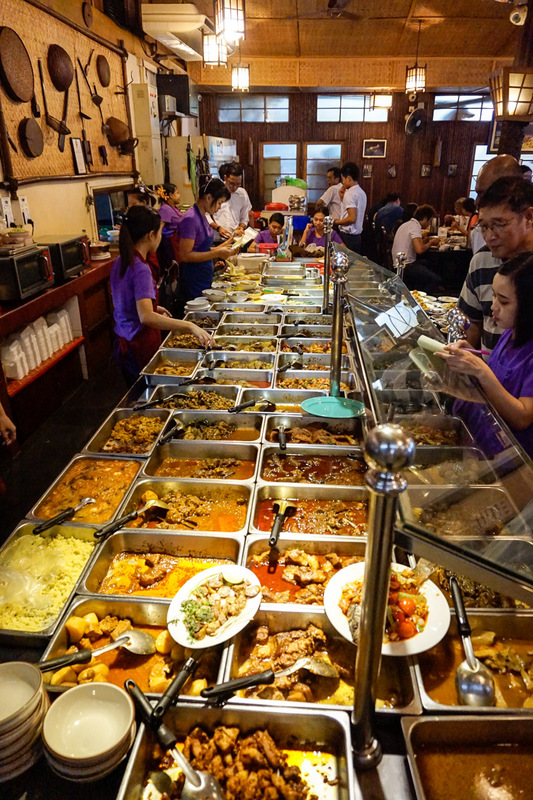 999 Noodle House – The highest rated restaurant in the whole of Yangon. Noodles galore! 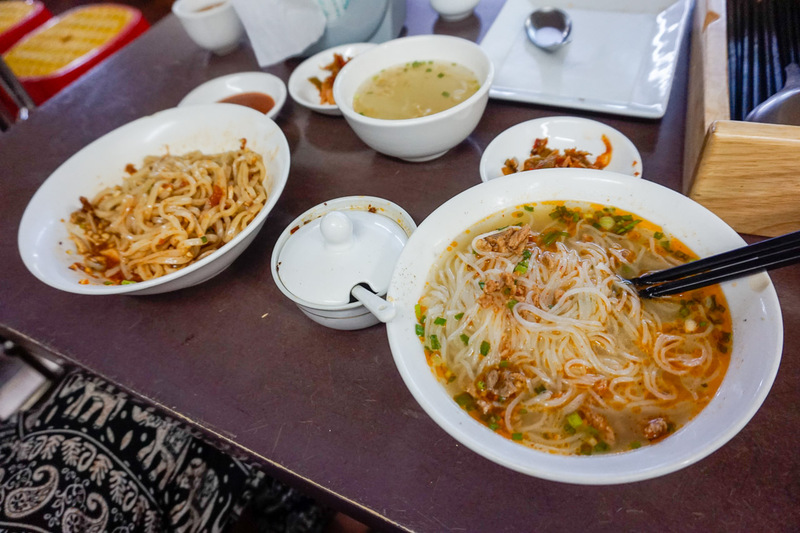 Sticky Shan Noodles for the win. So delicious! Cost $. Sharky’s – Western style restaurant with everything from cheese platters to salads, steaks and burgers. We ate here when we needed a break from the curries. Cost $$$. There’s no better way to discover a city than on foot. The city looks and feels chaotic but everything flows smoothly. There is something happening on every single corner, from food stalls to tea houses, playing children, toy markets, social gatherings, fruit stalls, you name it and it’s going on. The only problem we had walking the streets, was all the umbrellas were too low! When we couldn’t walk on the road, we had to duck our way under the umbrellas, sometimes clipping the tops of them. If you’re interested in learning more about the history, politics, culture & logistics of Yangon, jump on the free walking tour and ask as many questions as you want. We really enjoyed our walk. Our group was small and our guide had an answer to every question we threw at him. 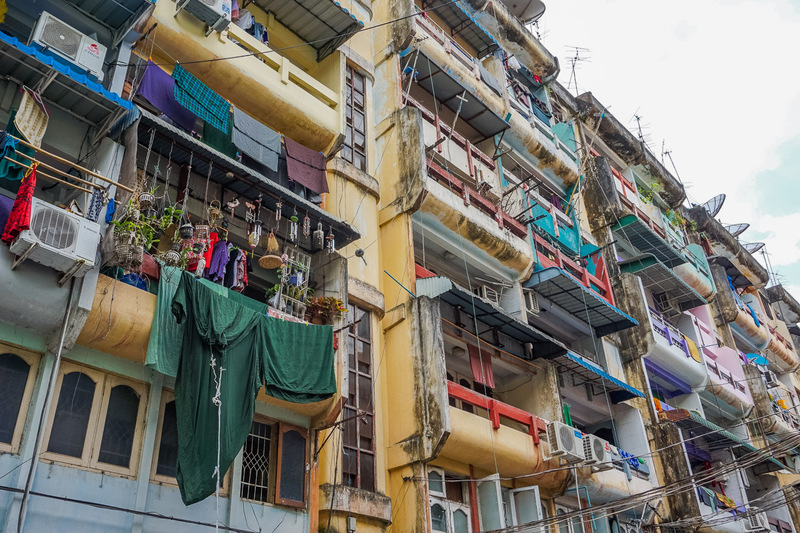 It was one of the most interesting free walking tours we’ve had, purely because we still had so much more to learn about this city and country. 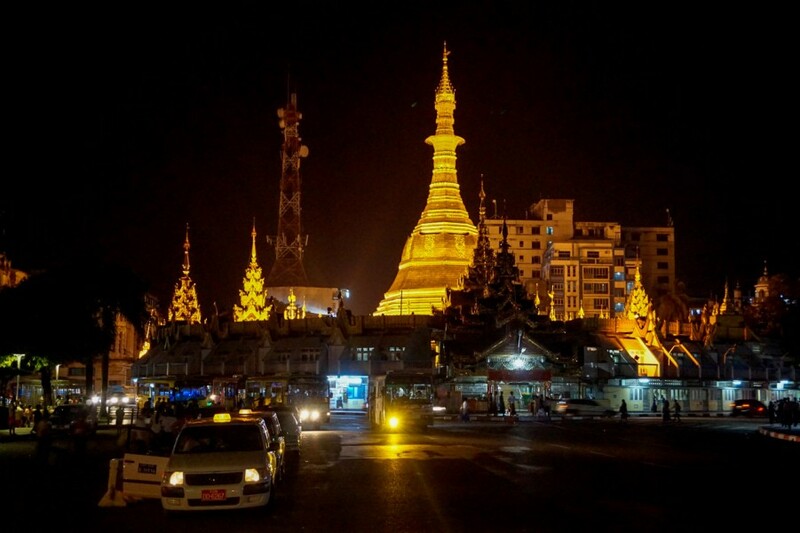 Yangon is one of the safest cities in the world. 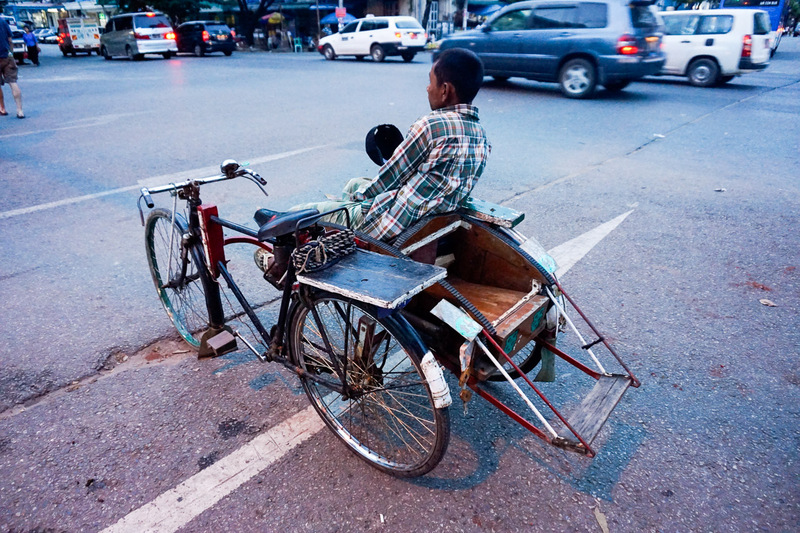 Street crime is almost non-existent and tourists are not targetted, we’re just waved at, photographed and smiled at. Burmese are also the most honest people we’ve come across and not once did we get taken advantage of for anything. It had been quite some time since we had had fresh fruit, well at least it felt like it. We definitely didn’t in Kathmandu, Nepal. 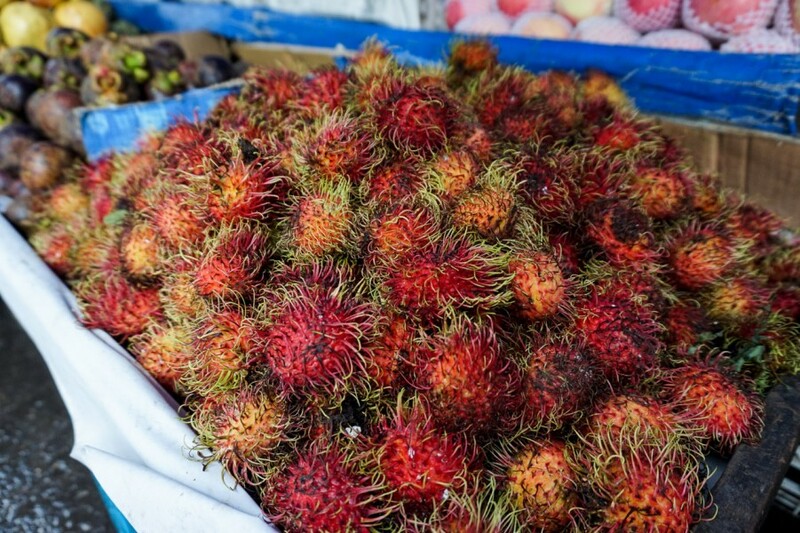 There are many food stalls on the street that sell very fresh fruits such as apples, mangos, watermelons, pineapples, oranges and of course some of the more exotic fruits such as the rambutan; a leathery red shaped fruit covered in spines, a sugar apple or a durian which is known as Asia’s “King of Fruits”. We bought 2 avocados for $0.50…$0.50c! Yes, that is correct, you read correctly. 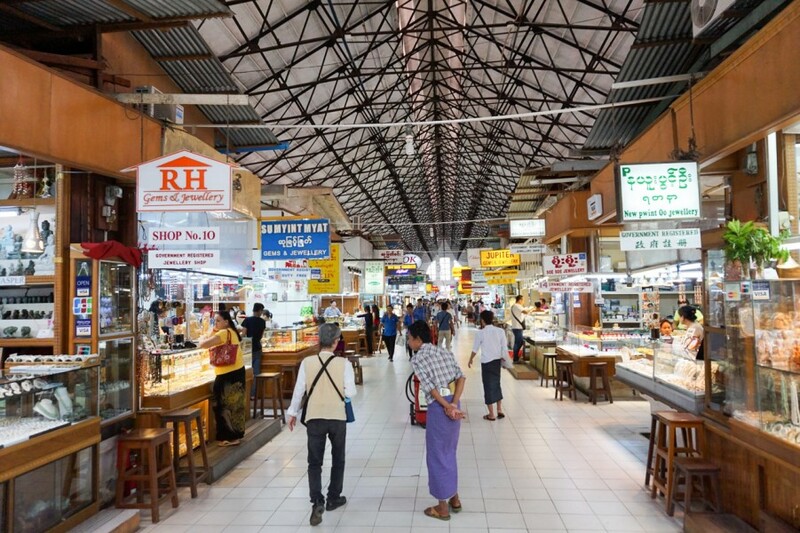 Bogyoke Aung San Market is a 70-year-old market sprawling over a few blocks on Bogyoke Aung San Road. There are 1000’s of stalls selling jewellery, handicrafts and textiles. 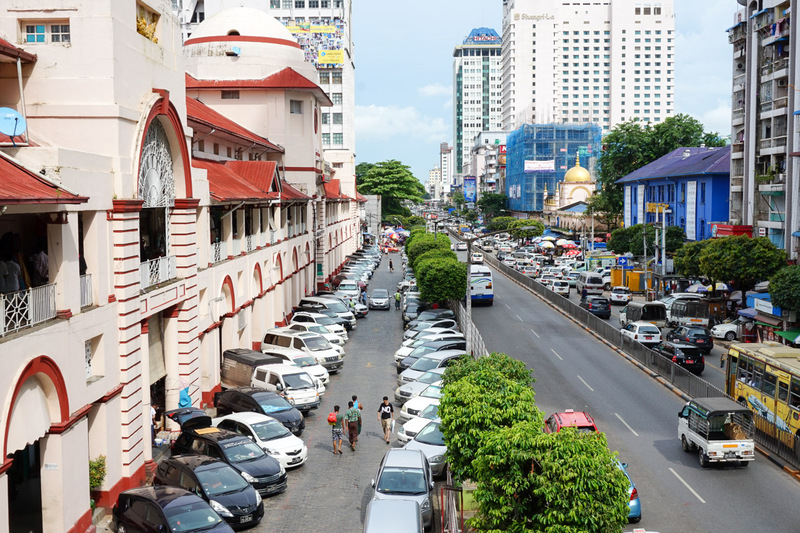 It’s probably the best-known tourist market and a pleasant shopping experience with minimal haggling. If you don’t come to shop, the locals are all about having a chat with you. Chinatown is west of the Sule Pagoda running from 18th street to 24th street and is definitely the busiest at night time. 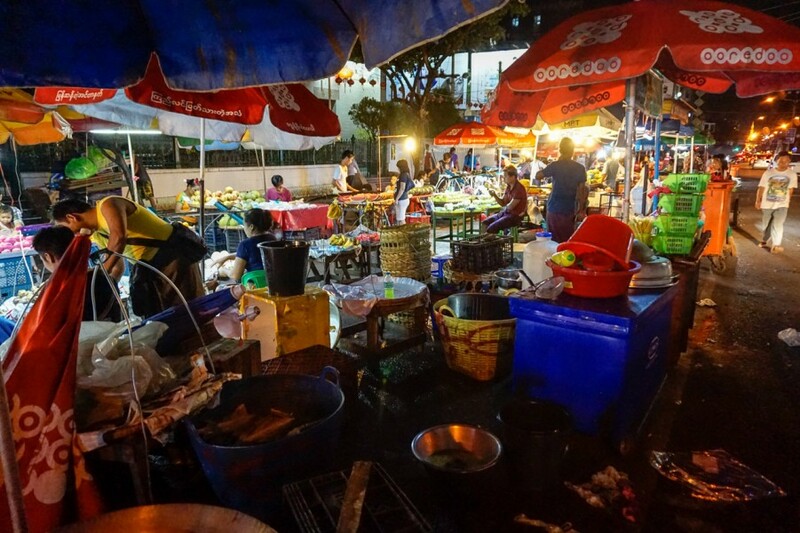 We strolled down here late on our first night in Yangon to try and find a bite to eat but were extremely put off by the amount of food, garbage, tissues and general mess on the ground. 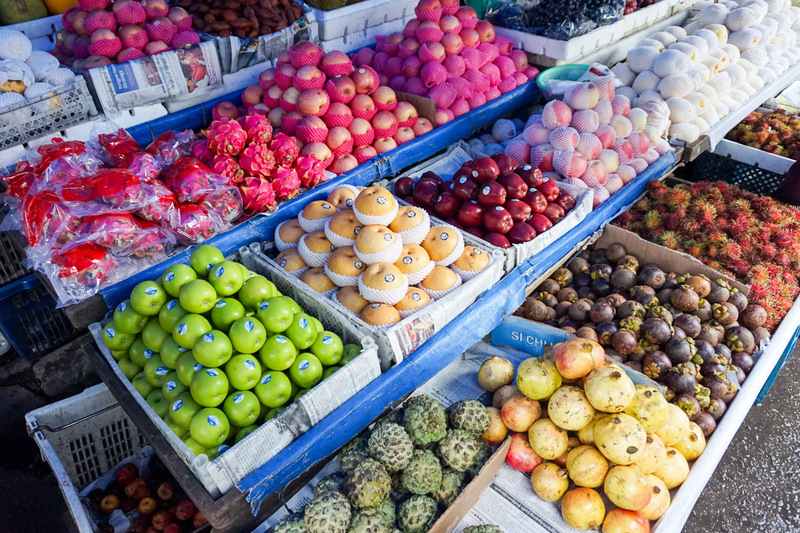 Needless to say, it is a one-stop visit to a variety of restaurants, jewellery stores, fruit markets, nick knack stores & mini-markets. 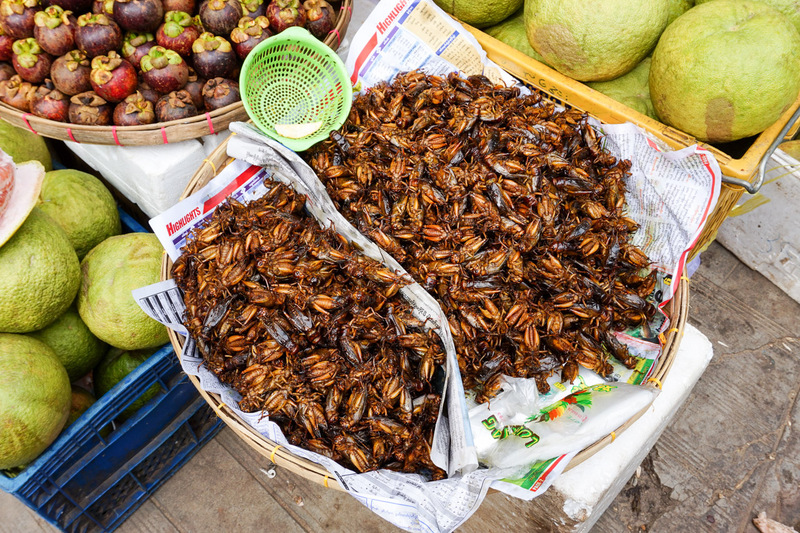 The roadside stalls sell everything from seafood to meat skewers, fried goods, steamed vegetables, noodles and of course, crickets. We can’t forget about the deliciousness of the crickets. Said no one ever. 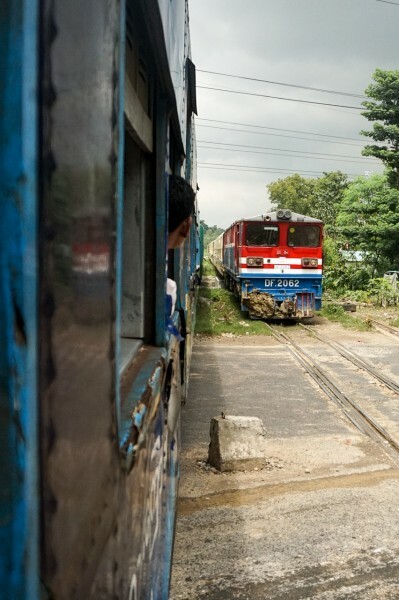 Last but definitely not least…ride the Circular Train like a local. This was our favourite thing to do in Yangon, it’s even got its own post. 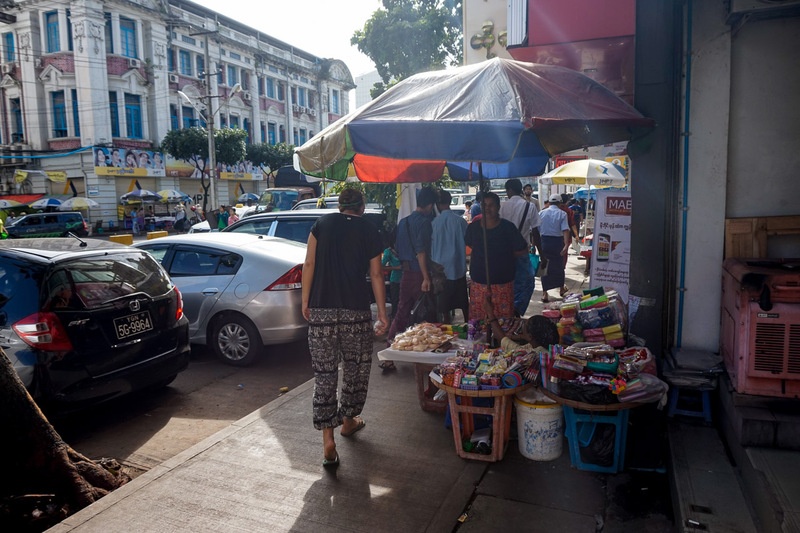 See how we rode like a local in Yangon. 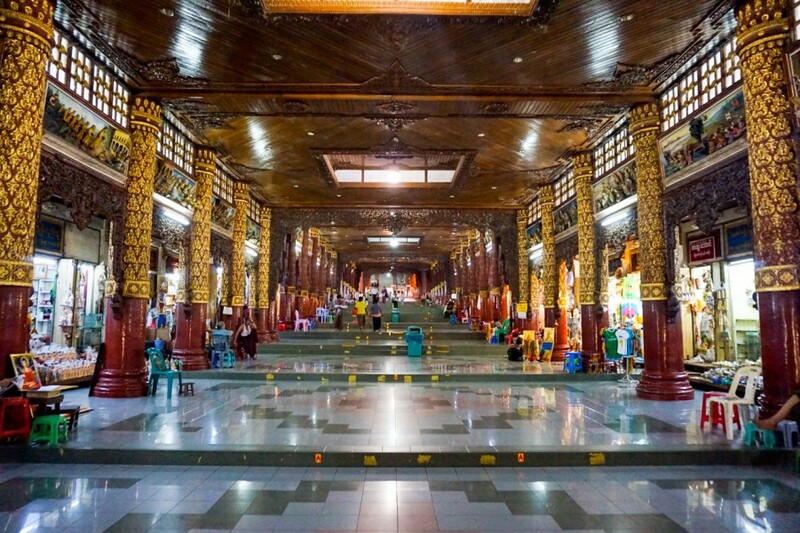 So, what’s the WiFi internet speed and availability like in Myanmar? 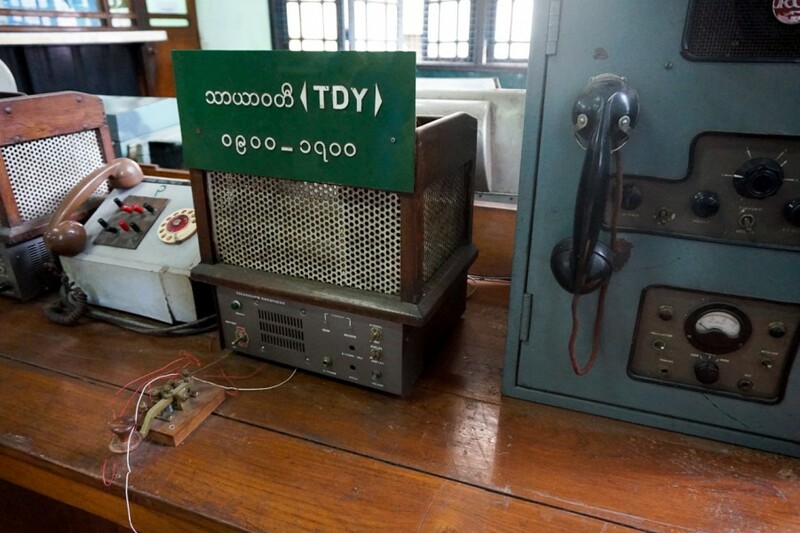 A country that you can still send telegrams in (seriously!). I had one worried husband before we arrived. 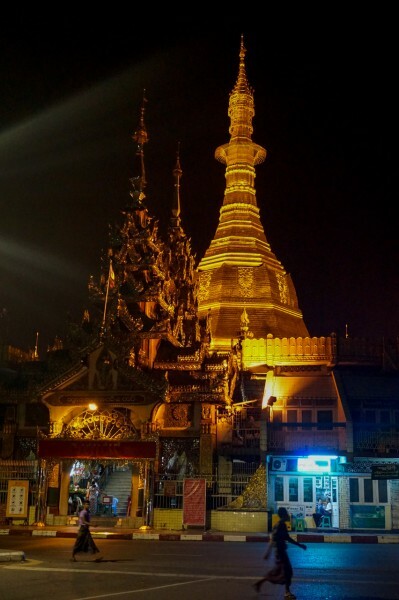 What is the Wifi speed like in Yangon? The WiFi speed in Yangon is reliable and quite fast, despite what many other online posts say. Since 2016 it’s gotten way better. You can do your emails, upload photos, stream videos and do general browsing. This said we did have issues with single file downloads (50mb+) such as zips and anything that you sync, such as Spotify Music. We stayed at Backpacker Bed & Breakfast and it was very fast (1.5Mbps download and 1Mbps upload). The small handful of restaurants & cafes geared towards tourists, generally have reliable WiFi too. You can get a sim card with a 4G connection (use Ooredoo carrier) and that costs US$1.20 for the sim and data is $3 for 1GB or $6 for 2.7GB. Head to the Ooredoo store for them to set it up for you & bring your passport (or picture of it) for registration. Wifi Speed in Bagan: The WiFi speed in Bagan is workable, especially during the day but come 7 pm it really slows down to a crawl. We found ‘Wetherspoons’ restaurant cafe to have a solid internet connection, with power points and good food. Wifi Speed in Inle Lake: As for Inle Lake, it’s terrible at best and we recommend a sim card for hot-spotting in that area. Yangon was one fascinating city and we’re glad we were able to experience it before an influx of tourists. We fell in love with the people of Myanmar immediately, so we were very excited to head North towards Bagan for its temples and Inle Lake for our trek! 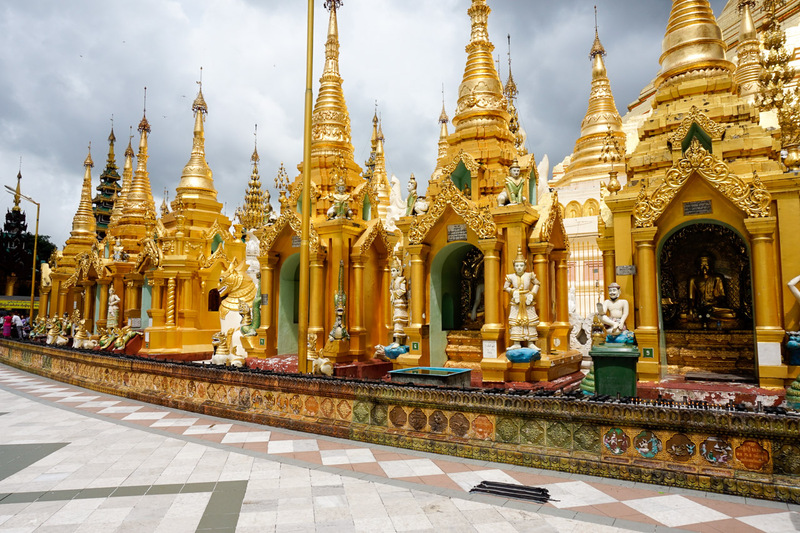 Two incredibly beautiful places that shouldn’t be missed on any trip to Myanmar! 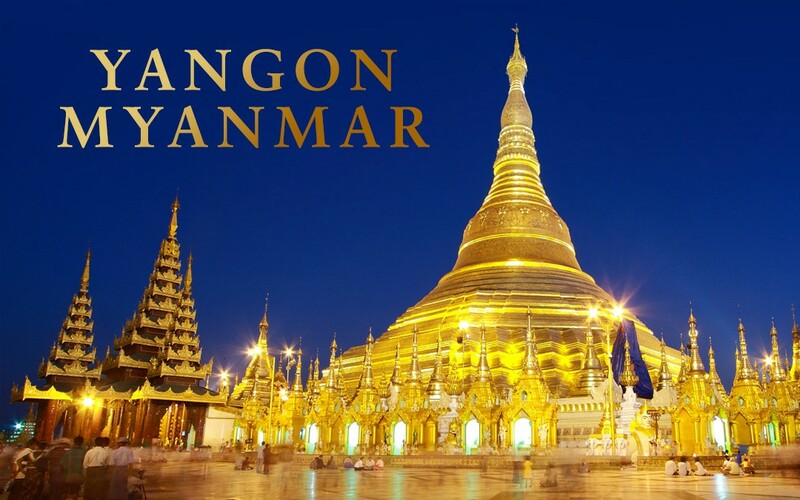 Book your transport to Bagan here. If you liked this article, pin it to your Pinterest page with the image below. 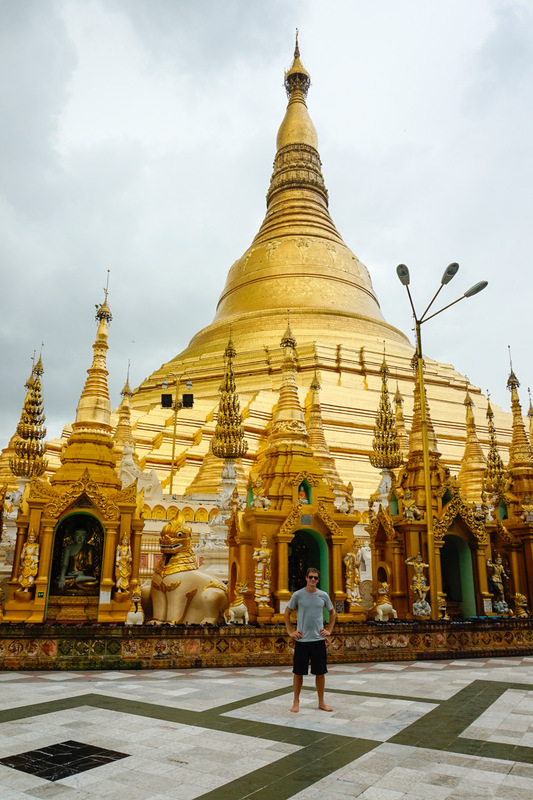 I skipped Myanmar this year because of the lagging internet speeds. 1.5Mbps down is about the slowest I’m willing to go, but appreciate the info nonetheless as most posts on the topic are gloomy and slightly dated. 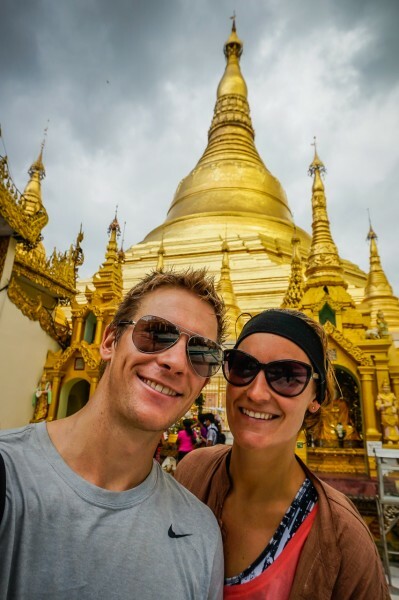 How were the speeds in Bagan and Inle Lake? The wifi speed in Bagan was OK but it went in phases (anything after 6pm was rubbish due to high load). Enough for the essentials. Inle Lake were extremely frustrating and we hot-spotted our phones for the entire duration we were here and after talking with some of the hotel owners, they seem to do the same thing too. Nice tips, Beautiful write up and Awesome pics from Myanmar. Thanks Rupam! It was such a beautiful country. Thanks for reading! I’m so glad to hear the post was helpful 🙂 Enjoy! Ps, we love South Africans!